Remember yesterday when I described the Alcatel MagicFlip as the smallest ereader I had ever handled? I wish I had held that post, because about an hour later I found an even smaller device. Gajah, a Singapore-based OEM that specializes in tablets, ereaders, and consumer electronics, their InkCase smartphone cases a step further. They did away with the case entirely, and came up with a smartphone accessory which adds a 3.5" E-ink screen to any Bluetooth enabled Android smartphone. 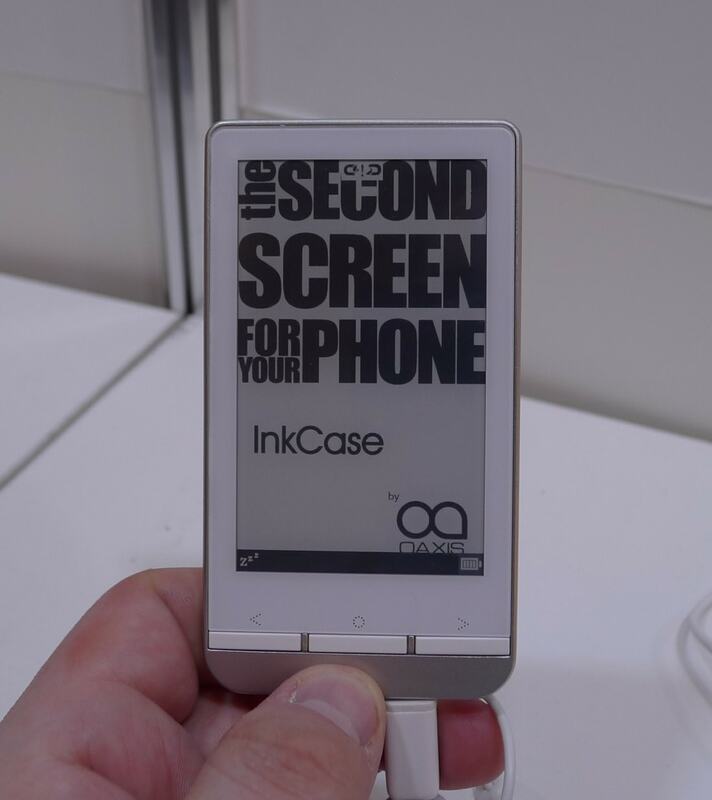 Gajah's current InkCase models add an E-ink screen to either an iPhone, Samsung Galaxy Note 2, or Samsung S4. As I am sure you know, this is a rather limited selection of supported models (there are hundreds of Android smartphones on the market) so rather than try support all Android smartphones with unique covers Gajah instead released one pocketable device which should work with all of them. The ic3510 has a 3.5" E-ink screen with a resolution of 360 x 600. This is the same screen as on Gajah's case for the iPhone 5, only the ic3510 has been stripped of the plastic needed to attach the screen to the iPhone. This resulted in a much smaller device that is about the size of a credit card. I didn't think to compare the sizes when I had the ic3510 in my hand, but a standard credit card measures 4" diagonally, so there's a chance that this really is smaller. And if nothing else, the ic3510 is much smaller than the Alcatel MagicFlip I saw yesterday. I got to play with the ic3510 at CES 2014. The firmware was still under development so didn't do much and it wasn't stable, but it was still fun to hold it in my hands. Then again, Gajah's existing InkCase model's don't do much either; the cases were announced 6 months ago and there are still only a few apps which work with them. The ic3510 is intended to pair with an Android smartphone over Bluetooth, and aside from the screen and BT the only other notable features are the 3 buttons on the front and the USB charging port. This is a very tiny and light ereader, almost dangerously so. Do you recall how one of the early Macbook Air review units got mixed in with a Sunday NYTimes and was accidentally thrown away? That could happen with the ic3510, only you wouldn't need nearly as much paper. This device could disappear into a single paper bill, and that could be a problem. Then again, maybe not. This device is small enough that you can carry it around in your pocket and never notice the weight. So long as an owner habitually puts the ic3510 in their pocket it should have little risk of getting lost. The ic3510 is scheduled to hit the market in the first half of this year. If we're lucky we'll get reports from users, explaining what they did to avoid discarding their new gadget. What type of books do they take? What store do they pull frm? None are supported natively – you need the companion app running on a smartphone or tablet. The companion app can push a number of different ebook formats to the InkCase, including Mobi, Epub, and others. But it only sends one page at a time. Very cute. I dislike this nonsense that manufacturers play with “companion devices”. It’s not like these weren’t technically capable of working standalone. If they just threw such a device and its technical documentation at a bunch of hobby developers, they’d have a proper standalone device in no time. Instead, they’re wasting resources to put their own and worse software on it as if people would ask for it.